The chief curator at the Istanbul Modern banned an artwork from a charity auction last month, sparking debate about the rise of censorship in Turkey. Turkish artist Bubi Hayon donated a wooden chair with a chamber pot on top of it to the fundraiser. Hayon was among several artists selected to submit works for the auction. Levent Calikoglu, the museum’s chief curator, said in an email interview with A.i.A that he knew Hayon was planning to donate a chair or throne made out of waste materials, but was not aware of the addition of the chamber pot until four days before the event. Asked what was inappropriate about the chamber pot, Calikoglu replied that the nature of the artwork was fundamentally altered with the addition, and that this new character was not in line with the fundraising aims of the event. He said that Hayon told him, “The bourgeoisie should learn about art,” when asked about the chamber pot, which he interpreted as another sign that Hayon was no longer cooperating with the museum’s objectives. Hayon, a 55-year-old Istanbul-based artist, told A.i.A. that the museum had given him no guidelines. “If in fact they had placed any limitation or interference, I would not have accepted the offer,” he said. “An artist does not consider whether his creation is appropriate for exhibition or not, whether it is liked or not. He does not create with the apprehension of sale or approval,” he said. His intention with the artwork, he said, was to present an object that is normally a symbol of power and control in an ironic way. He also hoped that the work would question taboos on the sacredness of art and point out that museums are not places of worship. By vetoing his work, Hayon said, the museum decided for its guests what was good for them without consulting them, as if protecting them from danger or obscenity. It reflects a limited notion of what guests are capable of appreciating, he said. Members of the Turkish art community have rallied around Hayon. A panel discussion at the museum two weeks after the work was banned about an exhibition of women’s art in Turkey titled “Dreams and Reality,” morphed into a protest against censorship. Eight artists, including Leyla Gediz and Inci Furni, asked that their works be removed from “Dreams and Reality” in response to the Modern’s actions. Over 288 members of the art community have since signed a petition, written by artist Hakan Akcura, condemning censorship. The Istanbul Modern has defended itself, claiming that the art community’s reaction is disproportionate to the events. Calikoglu said the Gala was a private event intended to support the museum’s educational programs, and the selected artists volunteered their work, knowing that the museum was aiming to sell and profit from their contributions. “If artists are free to change their minds and alter their creations at the last minute, then the curator, too, should have the right to decide not to include the object in the process, especially when the alteration fundamentally changes the essence of the project,” he said. On December 27, artists arrived at the Istanbul Museum of Modern Art (Istanbul Modern) with a banner that read “There is censorship in this museum,” and hung posters declaring “We spotted censorship” alongside their work in the exhibition, “Dream and Reality.” The action came amid a storm of criticism from the Turkish art community, directed at the privately funded museum for suppressing freedom of expression, after the institution refused to enter a commissioned artwork by Bubi Hayon into a fundraising auction or to acquire the artwork for its permanent collection. The museum provoked further ire for its unapologetic response to the artist and the subsequent outcry from other members of the art community. 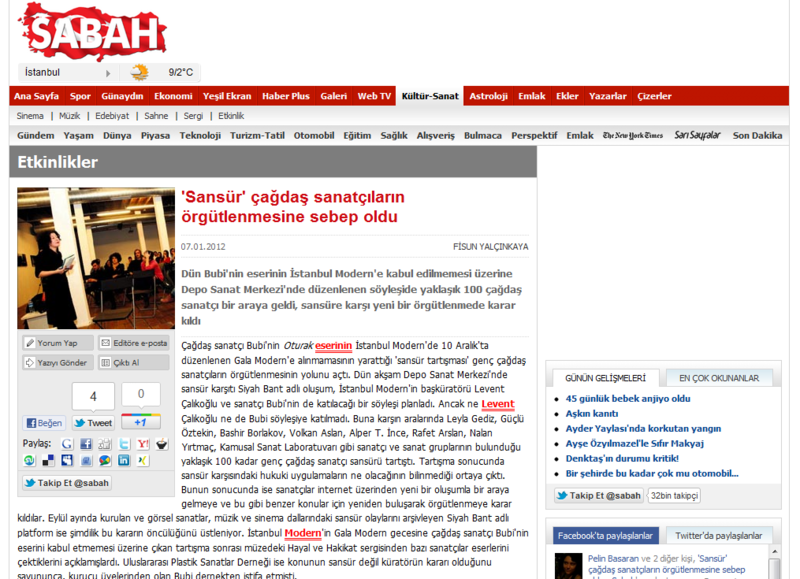 The affair first became public earlier in December when, in a written statement, Hayon accused Istanbul Modern of censorship. The sculptor was one of eight artists originally selected to create works for the museum’s seventh annual Gala Modern, held on December 10, to support the institution’s educational program. 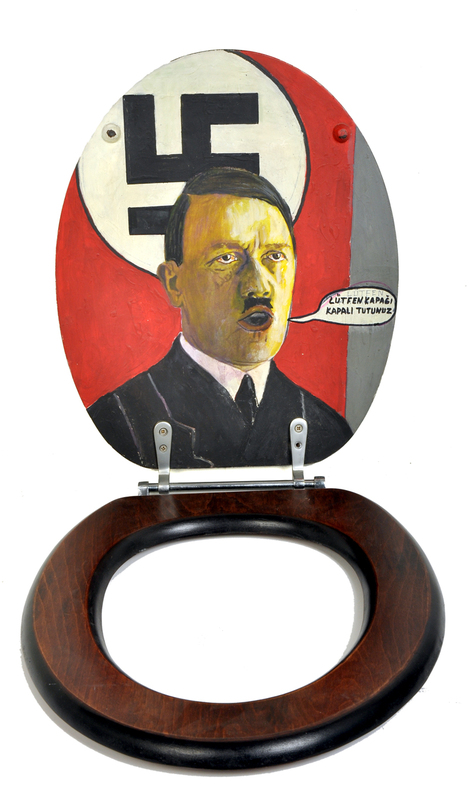 His sculpture Oturak (“Chamber Pot,” 2011), an upright wooden chair with bedpan embedded in the seat, was not displayed after curators asked him to make modifications to the piece—specifically, to cover up the toilet seat—and Hayon refused. Hayon insisted that the museum gave him full creative freedom in conceiving the work and that it did not specify the piece’s purpose when he was first approached about the commission. The artist claims that Oturak was intended to be critical of the quasi-sacred status of art museums in society. After seeing the final outcome, Istanbul Modern claimed that the artwork did not meet the proper requirements for the auction and would not accept it without alterations. The artist and others speculated that the museum deemed the piece not as saleable with the chamber pot in its seat, and that this was the motivation for asking him to cover up, or remove, the supposedly undesirable component. After Hayon had circulated his account of the episode, other members of the Turkish art community agreed that the museum was committing a form of soft or “conditional” censorship. Numerous discussions were held on social media sites, leading many people to express long-held frustrations with the museum’s lack of professionalism. However, even within the art community, there was broad disagreement about whether Istanbul Modern’s decision did in fact constitute censorship. 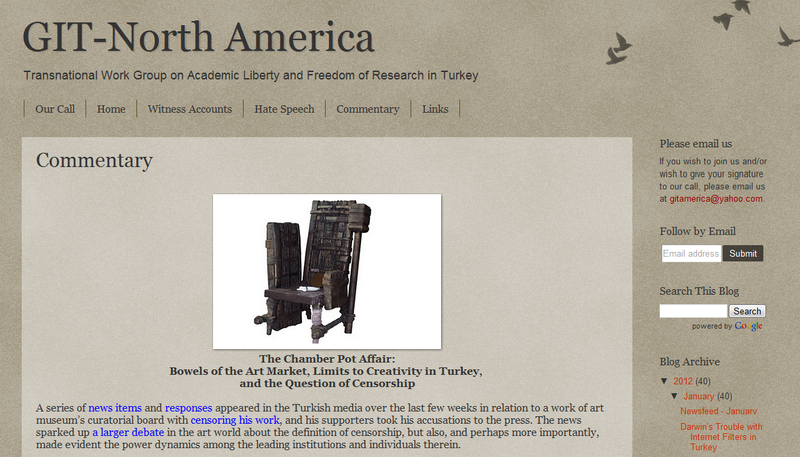 The board of directors of both the Turkish National Committee of the International Plastic Arts Association (IPAA) and the International Association of Art Critics (IAAC) released separate statements saying they did not believe the musuem’s action was censorship, because the event was a private auction, closed to the public, and there was no third-party intervention that caused the work to be removed. Moreover, Istanbul Modern has maintained that its curators had the right to select which artworks would be included in the auction. Hayon, a member of the IPAA, resigned on December 26. On December 27, a panel discussion in the Istanbul Modern auditorium, in conjunction with the current exhibition “Dream and Reality,” turned into a public discussion of the incident—though neither Hayon nor any of museums’ curators were present. One of the evening’s panelists, artist Mürüvvet Türkyılmaz, announced that she would remove her work from “Dream and Reality” in protest and walked out of the museum because she believed that the institution was no longer taking care of artists shown under its roof. 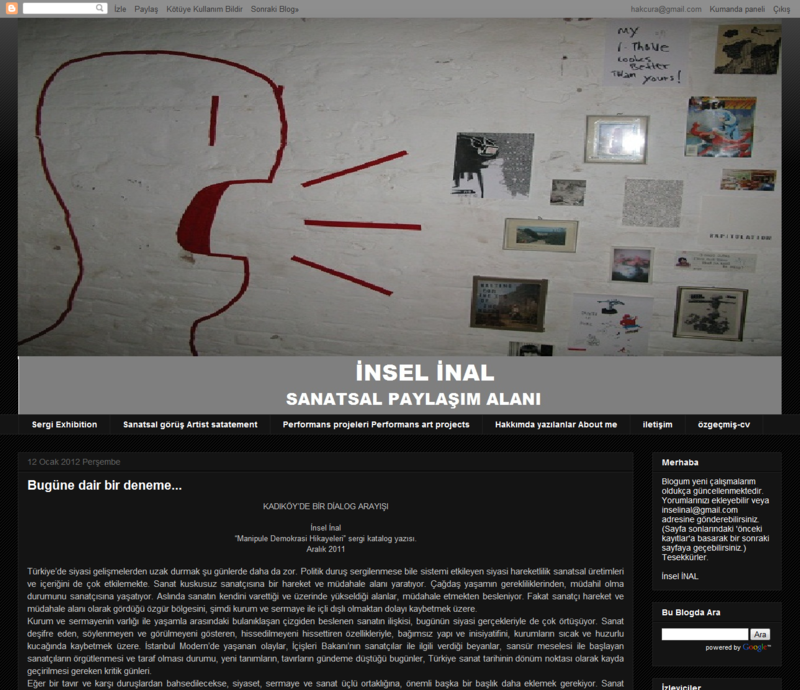 Eight other artists—Ceren Öyküt, Gözde İlkin, Güneş Terkol, İnci Furni, Ekin Saçlıoğlu, Neriman Polat, Leyla Gediz and the collective AtılKunst—subsequently announced that they too would withdraw their works from the exhibition. 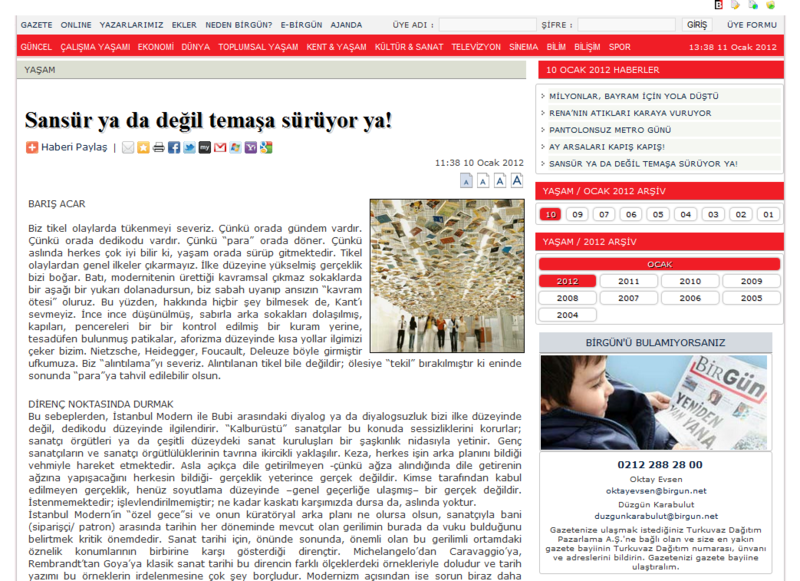 However, the museum’s chief curator Levent Çalıkoğlu told the English-language daily newspaper Today’s Zaman that Istanbul Modern would honor the artists’ wishes to have their works removed from “Dream and Reality.” Despite media reports that the pieces had been taken down, as of January 3, none of the artworks had been physically removed or altered. The exhibition closes in two weeks, on January 21. Istanbul Modern is privately funded by the corporate holding company Eczacıbaşı Group, which comprises 39 enterprises in diverse industries. The museum’s collection is comprised of artworks on long-term loan or donated to the museum by the Dr. Nejat F. Eczacıbaşı Foundation, Oya-Bülent Eczacıbaşı Collection and other private collections. Oya Eczacıbaşı is the chair of the museum’s board of directors. All of Turkey’s major cultural institutions are backed by corporate holding groups, as there are no national art museums or state-funded galleries. A persistent complaint in the Turkish art community—again raised during debates over the Hayon incident—is that cultural institutions have no public accountability and their decision-making processes are nontransparent. Despite their claims of adhering to “standard international practice,” Istanbul Modern, since opening in 2004, has run into problems before in working both with artists—most notably over a large-scale film commission by Doug Aitken—and professional curators, as in the case of David Elliott, who served as the museum’s director for just eight months in 2007. On this occasion, the artist Hakan Akçura has also circulated an online petition, signed by prominent members of the Istanbul art community and several international figures, decrying the incident as an act of “conditional” and “commercially orientated” censorship. In a light-hearted moment, the petition announces that “Our guiding free spirit is awareness of our existence and surely is R. Mutt’s Fountain”—a reference to another famously censored toilet-as-artwork: Marcel Duchamp’s readymade, upturned urinal, which was hidden from view in 1917 exhibition at the Society of Independent Artists in Philadelphia. A series of news items and responses appeared in the Turkish media over the last few weeks in relation to a work of art commissioned and subsequently rejected by Istanbul Modern Art Museum. The artist, Bubi Hayon, accused the museum’s curatorial board with censoring his work, and his supporters took his accusations to the press. The news sparked up a larger debate in the art world about the definition of censorship, but also, and perhaps more importantly, made evident the power dynamics among the leading institutions and individuals therein. The “chamber pot” incident differs from the more common kinds of debates centered on accusations of censorship of art commissions and the publicity that ensues thereafter around the globe (one notorious historical example of which is Andy Warhol’s 13 Most Wanted Men); and the difference is twofold. First, the work was commissioned for auctioning purposes only and would be displayed at an exclusive after-hour fundraiser event organized only for collectors. Second, because there was no legal contract signed between the artist and the museum, there was little proof other than the post-event testimonials of both parties. 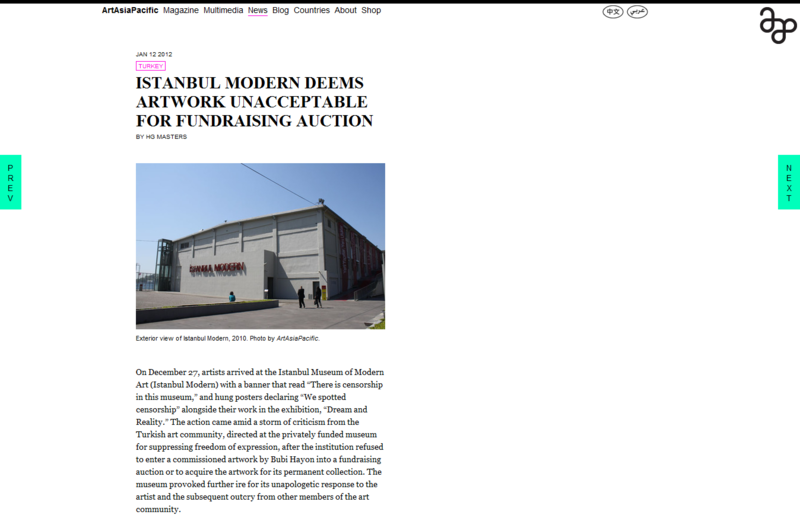 Regardless of the eventual rejection of the work (without providing a comprehensive reason) or whether or not that qualifies as censorship, it was mind-boggling that an art institution internationally recognized and as well-established as Istanbul Modern could patronize works without assuming any accountability and could see it fit to operate in a vague, unprofessional, insensitive and top-down framework. However the subsequent response of the museum as well as the attitude of other institutions that took part in the public debate revealed dirtier secrets of the networks of patronage, production and distribution of works of art in Turkey. The patent uncritical justification adopted by the museum was that the artist was well aware of “the primary purpose of the work” he was asked to create, which “was to raise funds”: it was a selection based solely on marketability! Shockingly, the Turkey section of International Association of Art Critics (AICA) and Turkish National Committee of the International Plastic Arts Association (UNESCO AIAP) seemed to join forces with the museum in an effort to marginalize the artist Bubi Hayon. 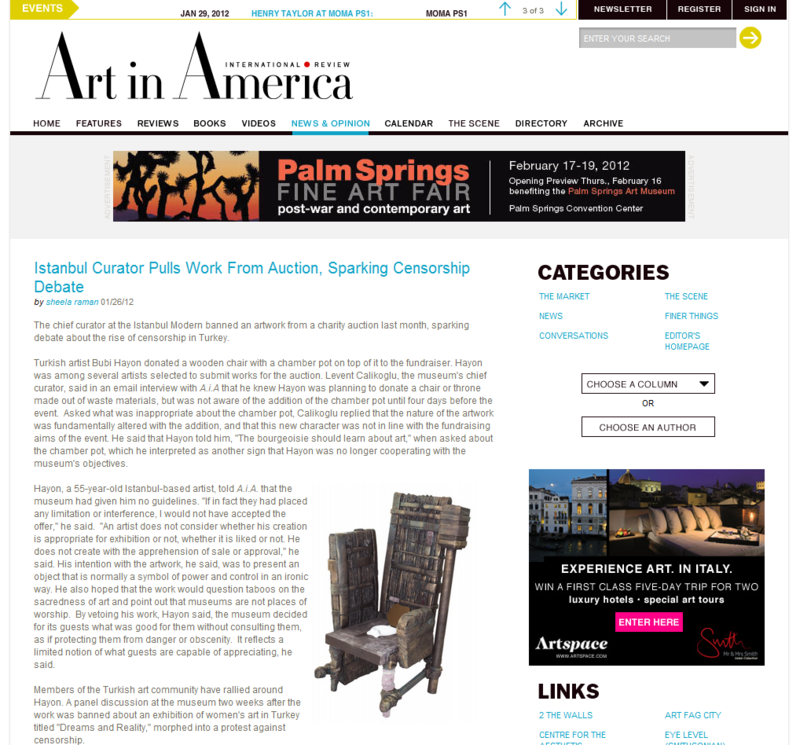 Especially the last press release of AIAP hinted monopoly over claims to political engagement and social activism in the Turkish art circles, as well as stating that an artist’s rejection should be her emotional struggle and not a publicity-driven petition. The sincerity of the cause of the artist and its supporters was deemed questionable because of their lack of engagement with other sociopolitical causes. 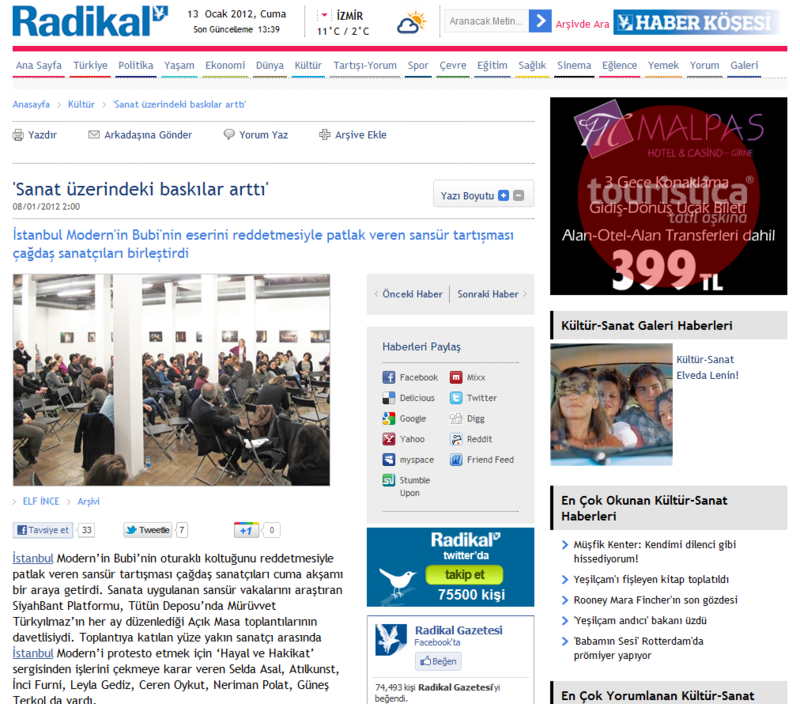 For more (in Turkish) on the acts of other artists in protest of Istanbul Modern’s curatorial team go to a news item and a related commentary on Radikal. “Manipule Demokrasi Hikayeleri” sergi katalog yazısı. Türkiye’de siyasi gelişmelerden uzak durmak şu günlerde daha da zor. Politik duruş sergilenmese bile sistemi etkileyen siyasi hareketlilik sanatsal üretimleri ve içeriğini de çok etkilemekte. Sanat kuskusuz sanatçısına bir hareket ve müdahale alanı yaratıyor. Çağdaş yaşamın gerekliliklerinden, müdahil olma durumunu sanatçısına yaşatıyor. Aslında sanatın kendini varettiği ve üzerinde yükseldiği alanlar, müdahale etmekten besleniyor. Fakat sanatçı hareket ve müdahale alanı olarak gördüğü özgür bölgesini, şimdi kurum ve sermaye ile içli dışlı olmaktan dolayı kaybetmek üzere. Kurum ve sermayenin varlığı ile yaşamla arasındaki bulanıklaşan çizgiden beslenen sanatın ilişkisi, bugünün siyasi gerçekleriyle de çok örtüşüyor. Sanat deşifre eden, söylenmeyen ve görülmeyeni gösteren, hissedilmeyeni hissettiren özellikleriyle, bağımsız yapı ve inisiyatifini, kurumların sıcak ve huzurlu kucağında kaybetmek üzere. İstanbul Modern’de yaşanan olaylar, İçişleri Bakanı’nın sanatçılar ile ilgili verdiği beyanlar, sansür meselesi ile başlayan sanatçıların örgütlenmesi ve taraf olması durumu, yeni tanımların, tavırların gündeme düştüğü bugünler, Türkiye sanat tarihinin dönüm noktası olarak kayda geçirilmesi gereken kritik günleri. Eğer bir tavır ve karşı duruşlardan bahsedilecekse, siyaset, sermaye ve sanat üçlü ortaklığına, önemli başka bir başlık daha eklemek gerekiyor. Sanat eğitimi. Bugüne kadar ve hala sanat eğitiminde merkezde olmanın sanatta başarılı olmakla eş olduğu öğretiliyorsa, sanatın tanımıyla özdeşleşmeyen bir eğitim modeli ile karşı karşıya olduğumuzu bilmeliyiz. Öğrenciye, geleceğinde müzede ve galeride var olmasını amaçlatan sanat eğitimi, biçim, malzeme ve işçilik odaklı, sektörel, endüstriyel ve mesleki eğitimler halinde verilmekte. Söz geliştirmek ve bir duruş sergilemek üzere verilecek eğitimlerle, çeperde veya dışarıda kalmanın avantajı ile özgürce eleştiri üretmek yerine, merkezde olamadığı için kendini başarısız hisseden sanatçı adaylarının sayısı o kadar fazla ki… Sanat eğitimcisinin, bu eleştirel bakışı arttıran metodları eğitiminde geliştirebilmesi, onun bir aktivist olarak yaşama karışmasını da sağlar düşüncesindeyim. Yaşamdaki tüm düzen ve mutluluk manipulasyonlarını sanatçılar üzerinden de okumak gerekiyor. Zira bu okumalar doğrultusunda, özellikle çeperde olmanın bağımsızlığıyla kendini vareden sanatçıların, bu oyunu bozmak için yaptığı sanatsal eylemlerini seyretmek önemli bir gereksinim haline geldi. Bu sergi de, siyaset, sermaye-kurum ve eğitim dahilinde, demokrasinin yeniden sorgulanabilmesinin umudunu taşıyor. Demokrasi tanımının, farklı sosyal sınıf ve ideolojilere göre değiştiği aşikar. Bu nedenle sergi, kendini var eden oluşumlar içinde bile yaptırımcı duruşuyla, seyirciye demokrasinin ne kadar manipulatif bir durum olduğunu sorgulatırken, demokrasi kavramının da kişinin yaşadığı yere, ideolojisine, hatta cinsiyetine göre değişkenlik gösterebileceğini vurguluyor. Sanatçıların kendi eleştiri, bilgi ve gerçeklerini, birçok manipule demokrasi hikâyeleri ile eserlerin üzerinden ulaştırdıkları bu sergi, biçimsel bağımlılıklar ve disiplinlerden uzak, sözü ile kendine yer arayan bir biçimi dize getirdi. Yine kolektif bir duruşla birlikte dialog kurmayı, başka projeleri çağrıştırmayı amaçladı. Birbirini tanımayan bir çok sanatçı, 90’ların ruhunu çağırıştırırcasına kendi hikayelerini yan yana dizerek bütünü, dışarısını deşifre etmek için sergi mekanına taşıdı. Alternatif olma kaygısından uzak, hiçbir hiyerarşik veya sınıf ayrımı olmadan, satmak, sanat tarihine girmek veya ileride müzede sergilenmeyi amaçlamadan Kadıköy’deki seyircisiyle buluştu. Kadıköy’ün sanatçılar arasında yükselen diyalog arayışı ve birlikteliğine de bir katkı vererek, kendisini varetti. “Liberate yourself from being nice” Daha çok feministlerin bir söylemi olan bu cümleyle yazıya başlamak istedim. Çevirisi ve genişletilmiş anlamı; “Kendini cici kız, hanım kız, edepli kız olmaktan kurtar, özgürleştir.” Ben de öyle yaptım. Çünkü edepsizce yazılan bir yazıya ancak böyle bir üslupla cevap vermenin gereği kaçınılmaz oldu. Türkiye kamuoyuna seslenen bir sanat dergisinin editörü, olanca kişisel, olanca yanlı ve olanca haddini aşan bir yazıyı hem de editör köşesinden yazınca. Nusret efendi, bu günlerde bir “Bubi Vakası” yaşanmıyor. Bu günlerde “Bir sanatçının yapıtına sansür koyan bir müze vakası” yaşanıyor. Devamında da; İstanbul Modern’in sansürcü tavrına karşı, gerek sistemin içinden gerekse dışından tepki gösteren, sanatın kamusallığına, özgürlüğüne ve devrimci ruhuna inanan ve bu konuda duyarlı olan sanat alanından insanların karşı koyuş eylemleri yaşanıyor. Bunlardan biri, sanatçı Hakan Akçura’nın öncülüğünde yazılan basın bildirisi ve üç gün içinde 300’e yakın kişinin destek verdiği imza kampanyası. Devam eden imza kampanyası halen sürüyor. Ardından 27 Aralık 2011 günü İstanbul Modern’de “Hayal ve Hakikat” sergisiyle ilgili düzenlenen panelde sansür konusu gündeme geldi. “Hayal ve Hakikat” sergisine katılan sanatçıların, müzeden “sansür”le ilgili sorularına cevap alamamaları üzerine üstelik kendilerine önceden söz verildiği halde konuyu tartışmak ya da açıklamak üzere müzeyi temsilen bir yetkilinin panele gelmemesi ve sanatçıların karşılarında muhatap bulamaması sonucunda AtılKunst, Mürüvvet Türkyılmaz, Ceren Oykut, Gözde İlkin, Güneş Terkol, İnci Furni, Neriman Polat adlı sanatçılar müzeden işlerini geri çektiler. Akabinde İnsel İnal ve öğrencilerinin üzerinde “Sansürü Gördük” yazılı pankartları müzenin duvarlarına asmaları ve kâğıttan yaptıkları uçak biçimi verilmiş “Müze Karşıtı Bildiri”leri kuşlama usulü dağıtmaları da, kurumun içinden gelen ilk tepki olan bir protest sanat eylemi olarak Türkiye sanatı tarihine geçti. Elbette Türkiye sanat ortamında bugüne kadar pek çok protest sergi, tavır ve açıklama yer aldı. Ancak bu açıklamalar zaten sisteme, müzeye, piyasalaşmaya karşı olan kesimlerce yapılıyordu. Bu kez müzeye karşı olmayan, sistemin içinden sanatçılar tarafından da ciddi bir karşı koyuş tavrı sergilendi. Bunun sonucunda müzede sergisi devam eden sanatçılar çalışmalarını geri çektiler ve sansürü de sansürü yapan kurumu da protesto ettiler. Nusret efendi, aynen itiraf ettiğin gibi müze numaraları var. Bu numaralar piyasalaşmanın bir parçası olarak her türlü oyunu, tahakkümü mübah sayar, tek geçer akçe olarak metayı tanırlar. Bu yaklaşımlar piyasa kurallarından başka kural tanımayan neo-liberal politikaların yaklaşımlardır. İstanbul Modern de aynen söylediğin gibi bir numara çekerek bu anlayışla hareket etmiştir. Otodidakt olan Bubi’yi yeterince tanımadığın bu yargılarından ortaya çıkıyor. Bubi, Türkiye sanat tarihinde tabuları estetik bir dille yıkan, eleştirisini sanatın içinden yapan ve kendine özgü dil oluşturabilmiş nadir sanatçılardan biri. Bilmediğin bir şey daha; Bubi, anarşist bir sanatçı. Oturak konusunu ilk kez işlemiyor ki; bu konuyla ilgili ilk çalışmasını 1976 da, ikincisini de 1999 yılında yapmıştı. Ayrıca 1978 yılında tuvalet duvar yazıları ile yaptığı tez müstehcen bulunduğu için reddedilmişti. Gördüğün gibi Bubi’nin başına bu tür olaylar ilk kez gelmiyor. Orijinalitesi olmayan diyorsun, bugüne kadar İstanbul Modern’de sergilenen hangi işin orijinalitesi var? Bubi’nin yapıtı Duchamp’ın “çeşme”si, Andy Warhol’un “elektrikli sandalye”si gibi maddeci kültürü eleştiren, sadece politik iktidara değil hayatın içindeki her türlü iktidara karşı çıkan bir gönderme yapıyor. Müzenin ibadethane olmadığını sanat yapıtının da tabu olmadığını Bubi üslubu ve Bubi diliyle anlatıyor, orijinalliği de buradan geliyor. Ayrıca sanatçı, koltuğunun altına bir iş alıp sergilenmesi talebinde bulunmuyor. Küratör sipariş veriyor ve siparişi verirken de sanatçıyı özgür bırakıyor, hiçbir ön koşul koymuyor bu nedenle de müzenin önkoşulsuz verdiği siparişi reddetme hakkı yok. Daha sonra müze, satış kaygısı duyarak yapıtı verili haliyle kabul etmiyor ve aracılar vasıtasıyla yapıtta değişiklik istiyor. Sanat yapıtına müdahale ederek Bubi’den oturak bölümünü ya kaldırmasını ya da üstünü örtmesini istiyor. İstanbul Modern’in sanatçı Bubi’nin yapıtını verili haliyle kabul etmeyip üzerinde değişiklik talep etmesi, sanatçı değişikliği kabul etmeyince de sergiden elemesi sanat yapıtına ve sanatçının özgür iradesine müdahaledir, sansürdür. Hem de bu sansür sadece Bubi’ye yapılmamıştır bütün sanatçılara yapılmıştır. Çünkü Bubi, bu konuda kamusal bir temsiliyettir. 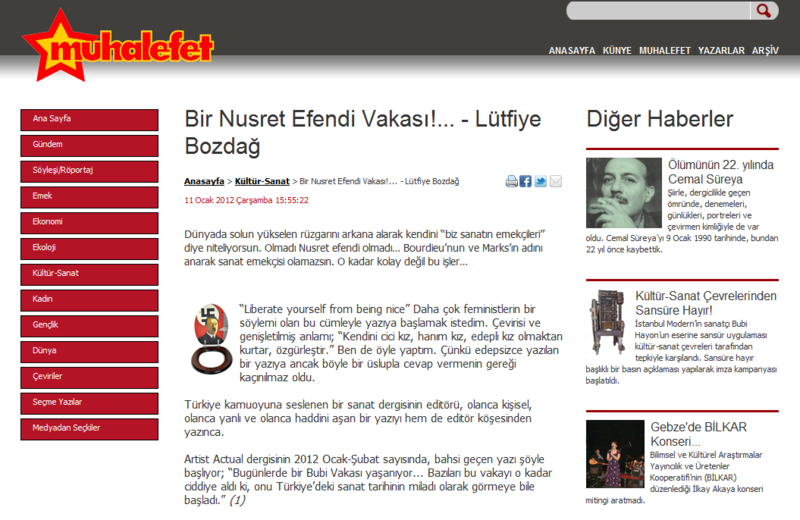 Nusret Efendi yanlış biliyorsun; Bubi, sanat kamuoyundan destek falan istemedi. Sadece kendisine yapılan sansürü kabul etmediğini kamuoyuna beyan etti. UPSD’nin kuruluş amacına ihanet ederek sansüre uğrayan sanatçıyı değil de sansürü uygulayan müzeyi haklı görmesi ve müzeden yana taraf olması sonucunda UPSD üyeliğinden istifa etti ve bunlara yönelik yaptığı basın açıklamalarıyla net ve kararlı bir duruş sergiledi. Duchamp’ın ruhunu yardıma çağırmıyoruz çünkü kendimizi o kadar aciz görmüyoruz. Sadece Duchamp’ı yâd ediyoruz, orada senin anlayamayacağın kadar ince bir empati ve idealizm var. Bu idealizmden ancak devrimci ruh anlar. Senin gibi kendini sahte sanat emekçisi zannedenler anlayamaz. Müzenin uyguladığı sansür karşısında “Hayal ve Hakikat” sergisinden işlerini çeken sanatçılardan birinin adını vermeden göstermelik bir muhalif ve marjinal tavır sergilediğinden dem vurup sanatçıyı edepsizlikle suçluyorsun, kendi edepsizliğini görmeden. Ne kadar haklısın Nusret efendi, tıpkı senin bu olayda ezilenden değil de ezenden yana, haklıdan değil de haksızdan yana taraf olman gibi. Senin bu sadakatin ve “kraldan çok kralcılığın” hem müze hem de Levent Çalıkoğlu tarafından ödüllendirilecektir. Bundan en ufak bir şüphem yok. Bütün bunlar yetmezmiş gibi Piere Bourdieu ve Marx isimlerini telaffuz ederek yükselen sol trende gönderme yapmayı da ihmal etmiyorsun ve “görüşünü hiç birimizin onaylayamayacağı “zavallı İçişleri Bakanı”’ndan dem vurarak bitiriyorsun. Ayrıca Artist Actual dergisinde editör yetkini kullanarak, sanatın kamusallığıyla ilgili konulara yer vermediğini buna karşın hangi sanatçılara yer verdiğini, kimleri parlattığını ve piyasada değer bulması için çabaladığını biliyoruz. Ama ne hikmetse bunların içinde bağımsız olarak sanat yapan bir tane bile sanat emekçisi yok. Bütün bunları yok sayıp sol trendden nemalanmaya çalışarak kamusaldan, sanat emekçilerinden söz etme. Çünkü hiç ikna edici değilsin. Başka bir yazının konusu olmakla birlikte Uluslararası Sanat Eleştirmenleri Derneği Türkiye Şubesi (AICA) ve Uluslararası Plastik Sanatlar Derneği Türkiye Şubesi (UPSD) sınıfta kaldı. Çünkü; AICA ve UPSD kuruluş amacına ihanet ederek sansüre uğrayan sanatçıyı değil de sansürü uygulayan müzeyi haklı gördü ve müzeden yana taraf oldu. Bunun nedeni “tamamen duygusal”; sanatın şirketleşmesinin piyasa üzerindeki yaptırımı ve bunun üzerine yapılan hesaplar. Nusret efendi, bir sanat dergisi editörü olarak sansürü görmezden gelmen, kamusallığı olan bir kurumun, sanat işletmecisi bir şirket gibi davranarak kapalı kapılar ardında sanat yapıtlarına tahakkümde bulunma eylemini haklı görmen hiç şaşırtıcı değil. Neden şeffaf olmadıklarını sorgulamak yerine müzenin sorgulanabilirliğini ortadan kaldıran antidemokratik tutumu desteklemen de hiç şaşırtıcı değil. Sansür ya da değil temaşa sürüyor ya! Biz tikel olaylarda tükenmeyi severiz. Çünkü orada gündem vardır. Çünkü orada dedikodu vardır. Çünkü “para” orada döner. Çünkü aslında herkes çok iyi bilir ki, yaşam orada sürüp gitmektedir. Tikel olaylardan genel ilkeler çıkarmayız. İlke düzeyine yükselmiş gerçeklik bizi boğar. Batı, modernitenin ürettiği kavramsal çıkmaz sokaklarda bir aşağı bir yukarı dolanadursun, biz sabah uyanıp ansızın “kavram ötesi” oluruz. Bu yüzden, hakkında hiçbir şey bilmesek de, Kant’ı sevmeyiz. İnce ince düşünülmüş, sabırla arka sokakları dolaşılmış, kapıları, pencereleri bir bir kontrol edilmiş bir kuram yerine, tesadüfen bulunmuş patikalar, aforizma düzeyinde kısa yollar ilgimizi çeker bizim. Nietzsche, Heidegger, Foucault, Deleuze böyle girmiştir ufkumuza. Biz “alıntılama”yı severiz. Alıntılanan tikel bile değildir; ölesiye “tekil” bırakılmıştır ki eninde sonunda “para”ya tahvil edilebilir olsun. Bu sebeplerden, İstanbul Modern ile Bubi arasındaki diyalog ya da diyalogsuzluk bizi ilke düzeyinde değil, dedikodu düzeyinde ilgilendirir. “Kalburüstü” sanatçılar bu konuda sessizliklerini korurlar; sanatçı örgütleri ya da çeşitli düzeydeki sanat kuruluşları bir şaşkınlık nidasıyla yetinir. Genç sanatçıların ve sanatçı örgütlülüklerinin tavrına ikircikli yaklaşılır. Keza, herkes işin arka planını bildiği vehmiyle hareket etmektedir. Asla açıkça dile getirilmeyen -çünkü ağza alındığında dile getirenin ağzına yapışacağını herkesin bildiği- gerçeklik yeterince gerçek değildir. Kimse tarafından kabul edilmeyen gerçeklik, henüz soyutlama düzeyinde –genel geçerliğe ulaşmış– bir gerçek değildir. İstenmemektedir; işlevlendirilmemiştir; ne kadar kaskatı karşımızda dursa da, aslında yoktur. İstanbul Modern’in “özel gece”si ve onun küratöryal arka planı ne olursa olsun, sanatçıyla bani (siparişçi/ patron) arasında tarihin her döneminde mevcut olan gerilimin burada da vuku bulduğunu belirtmek kritik önemdedir. Sanat tarihi için, önünde sonunda, önemli olan bu gerilimli ortamdaki öznelik konumlarının birbirine karşı gösterdiği dirençtir. Michelangelo’dan Caravaggio’ya, Rembrandt’tan Goya’ya klasik sanat tarihi bu direncin farklı ölçeklerdeki örnekleriyle doludur ve tarih yazımı bu örneklerin irdelenmesine çok şey borçludur. Modernizm açısından ise sorun biraz daha çetrefillidir. Keza görece özgür (sanatçının sanatsal yaratıdaki bağımsızlığının ona sözde koşulsuz şartsız teslim edildiği) bir dönemde sürtünme noktaları da direnç noktaları da görünmez olmuştur. Gerçekte ise söz konusu çatışma piyasa ilişkileri içinde çözülerek sanat tarihi yazımının iliklerine dek yayılmıştır. Sansür yok olmamış; sadece biçim değiştirdiği için gerçekte ortada neyin olup bittiğini seçmek zorlaşmıştır. Yoko Uno’dan Ai Weiwei’ye dek sanatçıyla onu kuşatan sistem arasındaki sürtüşme sürüp gitmekte, ancak, görünen o ki, bir zamanlar iskelesinin üstünde çalışırken kendisine komut vermeye çalışan kilise yetkilisine paletini, fırçasını fırlatan Michelangelo ekolünden sanatçı tipolojisi git gide kan kaybetmektedir. Yalnızca modern dönemler için konuşacak olursak şu soru önemlidir: Türkiye plastik sanatlar dünyasında sanatçının uğradığı kovuşturma ve baskılar ortadadır, hatta her geçen gün kat be kat artmaktadır; peki kaç çağdaş sanatçı bu duruma karşı bedel ödemeyi göze alarak hareket etmiştir/ etmektedir? Yazın dünyasında içinden geçtiği döneme karşı gösterdiği direnç yüzünden yıllarını sürgünde geçiren ya da halen hapiste olan sayısız kişi gösterilebilirken plastik sanatların bu ürkek sessizliği neye yorulabilir? Sansür ya da sansür olarak addedilebilecek gelişmeler, özellikle küratöryal uygulamaların yaygınlaştığı 90’lı yıllardan bu yana, çeşitli boyutlarda sürüp gitmekteyken Bubi’nin eline geçirdiği baltayla işini, bağışladığı kurumun önünde parçalara ayırmasını beklerdim. Bu gerçekleşmedi. Gerçekleşmesi istenebilir miydi; bunu da kestirmek güç. Bunun yerine, aynı mekânda bir grup genç çağdaş sanatçı “piyasa”nın tepkisini de üzerlerine çekmeyi göze alarak bir protesto gösterisi gerçekleştirdi; işlerini mevcut sergiden çekti; hâlâ da bu protestoyu yaygınlaştırmak için çaba gösteriyor. Alıntılar evreninde dedikodu tüketme alışkanlığından vazgeçeceksek öncelikle -kayıp olduğunu talkım satarak ilan ettiğimiz- öznelik konumları olarak neye karşılık geldiğimizi yeniden ölçüp biçmemiz gerekiyor. Belki buradan, kimilerinin ısrarla yaptığı gibi, alıntı üzerine alıntı yaparak sanatçıyı teröristten ayırt edecek gerekçeler üretme geleneği dışında, nicedir eksikliğini duyduğumuz, yeni bir kuramsal konumlanma bile çıkabilir. Kendi gerçekliğimizi sahiplenme zamanı gelmedi mi? İstanbul Modern’in Bubi’nin oturaklı koltuğunu reddetmesiyle patlak veren sansür tartışması çağdaş sanatçıları cuma akşamı bir araya getirdi. Sanata uygulanan sansür vakalarını araştıran SiyahBant Platformu, Tütün Deposu’nda Mürüvvet Türkyılmaz’ın her ay düzenlediği Açık Masa toplantılarının davetlisiydi. Toplantıya katılan yüze yakın sanatçı arasında İstanbul Modern’i protesto etmek için ‘Hayal ve Hakikat’ sergisinden işlerini çekmeye karar veren Selda Asal, Atılkunst, İnci Furni, Leyla Gediz, Ceren Oykut, Neriman Polat, Güneş Terkol da vardı. Toplantıda söz alan sanatçılar, çağdaş sanat piyasasının patlamasıyla sermayenin sanat üzerindeki baskısının arttığını, İçişleri Bakanı İdris Naim Şahin’in sanatı hedef alan konuşmasıyla “Devlet ve piyasa sansürünün bir araya geldiğini” dile getirdiler. Sansürle aslında çok sık karşılaştıklarını, ama genelde sessiz kaldıklarını belirten bazı sanatçılar, “İstanbul Modern vakası, bugüne kadar konuşulmayan birçok konunun tartışılmasına vesile oldu” dedi. Sanatçılar, galeriler ve kurumların kendilerine dayattıkları sözleşmeleri de eleştirdi. İstanbul Modern’den eserini çekmeye çalışan sanatçılardan biri “Bir şey imzalamışız haberimiz yok. Eserin kaldırılmaması için her türlü koşul var sözleşmede” diye konuştu. Sansürle mücadele etmek için nasıl bir yol izlenebileceği tartışılırken, örgütlü hareket etmenin ve sansür vakalarını yakından takip ederek sosyal medya ve basın yoluyla görünülür kılmanın önemine değinildi. Çağdaş sanatçı Bubi’nin Oturak eserinin İstanbul Modern’de 10 Aralık’ta düzenlenen Gala Modern’e alınmamasının yarattığı ‘sansür tartışması’ genç çağdaş sanatçıların örgütlenmesinin yolunu açtı. Dün akşam Depo Sanat Merkezi’nde sansür karşıtı Siyah Bant adlı oluşum, İstanbul Modern’in başküratörü Levent Çalıkoğlu ve sanatçı Bubi’nin de katılacağı bir söyleşi planladı. Ancak ne Levent Çalıkoğlu ne de Bubi söyleşiye katılmadı. Buna karşın aralarında Leyla Gediz, Güçlü Öztekin, Bashir Borlakov, Volkan Aslan, Alper T. İnce, Rafet Arslan, Nalan Yırtmaç, Kamusal Sanat Laboratuvarı gibi sanatçı ve sanat gruplarının bulunduğu yaklaşık 100 kadar genç çağdaş sanatçı sansürü tartıştı. Tartışma sonucunda sansür karşısındaki hukuki uygulamaların ne olacağının bilinmediği ortaya çıktı. Bunun sonucunda ise sanatçılar internet üzerinden yeni bir oluşumla bir araya gelmeye ve bu gibi benzer konular için yeniden buluşarak örgütlenmeye karar kıldılar. Eylül ayında kurulan ve görsel sanatlar, müzik ve sinema dallarındaki sansür olaylarını arşivleyen Siyah Bant adlı platform ise şimdilik bu kararın öncülüğünü üstleniyor. İstanbul Modern’in Gala Modern gecesine çağdaş sanatçı Bubi’nin eserini kabul etmemesi üzerine çıkan tartışma sonrası müzedeki Hayal ve Hakikat sergisinden bazı sanatçılar eserlerini çektiklerini açıklamışlardı. Uluslararası Plastik Sanatlar Derneği ise konunun sansür değil küratörün kararı olduğunu savununca, kurucu üyelerinden olan Bubi dernekten istifa etmişti.